Louisville’s Fandom Fest, already handicapped by its last-minute move to an old Macy’s store and the loss of more than half its celebrity guests, also opened Thursday under crowd restrictions imposed by the fire marshal. The pop-culture convention, which in past years has grown to attract up to 30,000 attendees some years, has only been approved to host 1,700 attendees at a time at its new venue at the vacant Macy’s in the Jefferson Mall. However, crowding doesn’t seem to have been a problem. WAVE3 reported on Friday (July 29): “Fandomfest continues as scheduled, despite criticism”. Here’s WAVE3’s on-air report, which shows how the Macy’s space is being used, and crowds are being monitored. Vendor load-in has begun at the Jefferson Mall for AbandonFest 2017. 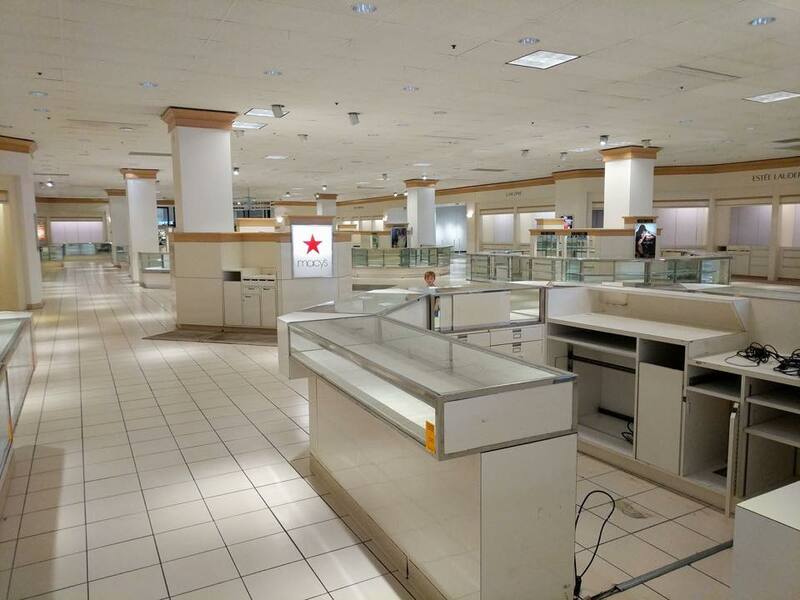 As of this time there is no air conditioning, the bathrooms exist, but who really knows, and all of the Macy’s fixtures are still in place (including the jewelry counters, which you see here). The escalators are also not working and to my knowledge there is one elevator. Can someone tell me how this convention will be accessible to someone in a wheelchair, who has health problems but simply wants to enjoy a con, or someone who cannot navigate stairs well and may need access to an escalator or elevator? Vendors are making the best of the situation and are working to overcome a less than ideal situation. However, vendors shouldn’t have been responsible for cleaning the space and getting it ready to set up. There are still poor event management practices at play here. I’m one of the Central Kentucky Admins for the Ohio River Valley Cosplayers (ORCs). We are guests at FandomFest and have a table and cosplay ER station set up on the second floor. I wasn’t able to make it to Louisville yesterday in time to get to the convention, but my associates reported a steady stream of visitors to the table. We made the conscious decision to uphold our commitment to be at this event despite the controversy, simply because we are a group whose sole mission is to promote positive cosplay experiences (“cospositivity”). While it would be hard to find a conrunner who would want to run an event in an empty department store, everyone seems to be making the best of it. What the hell, the place even has Wookiee massage chairs…. I would bet cash money that the unnamed vendor is pro wrestling curmudgeon-historian-retired performer Jim Cornette. He does a sideline in collectibles, and is local to the area. I wonder whether Daniels is actually in charge, or just the talent skilled at putting a good face on things; I also wonder how they kept “Security” (visible early) on the job — maybe they have money for perks with all those advertised stars’ transport not paid for? (And how little does a dead department store cost to rent?). If a vendor showed up with that huge set from SW6 (visible at 1:30ff), I can’t imagine them coming back with such a small turnout. All hail the net, which lets us watch meltdowns in real time instead of hearing about them afterwards (e.g. the Trek riotcon, which at least made it to 30K (so I’ve heard) before the fire dept. shut them down…). Your source, Kentucky Geek Girl has been proven to be misleading at least and an outright liar at best. I called her out over her posts because they were absolutely false. She then blocked me and deleted my comments after leaving foul mouthed comments towards me. GREAT SOURCE, NOT!!!!!! Scott Hrebicik: Is this just a drive-by slur? 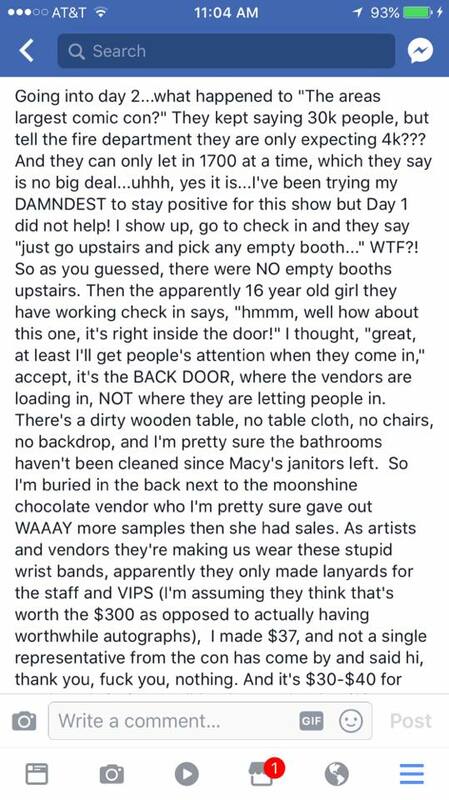 You don’t address any of her specifics quoted in this post — which are mainly about how the Macy’s space is being used and that some vendors have complaints. Fans paid $30 a day just to get in the door but were outraged, particularly on Saturday, over long lines that had them waiting hours for autographs and pictures. Some say they never got the memorabilia they came for even after all that time… in some cases, fans say they were left without the pictures and autographs they paid for in advance including some who shelled out extra for VIP access… Daniels also claimed they were hurt badly by 130 volunteers that were supposed to work crowd control that just didn’t show up. How bizarre, that a for-profit media convention pulling in at least a million dollars on ticket fees would think that relying on volunteers to make it successful is an acceptable business model. And it sure wasn’t the volunteers who gave 20 guest stars reason to cancel their appearances. @JJ: I wonder how many of the volunteers couldn’t get there? I don’t know what Louisville has for mass transit, but from the sampling of fans I know in Boston I would expect any of the big local cons to be in trouble if they left the concentrated part of the city. From what I’ve read, a commercial convention relying on perked volunteers isn’t unheard of (AFAICT, SDCC and Dragoncon among others), but not thinking about the effect of the move seems of a piece with their other failures. JJ: That is a 2013 story. Plus I think you mixed up “best” and “worst” there, Scott. Not exactly confidence-building. Mike Glyer: That is a 2013 story. Thanks for catching that. How bizarre, that a TV news channel wouldn’t put a date-stamp on their online stories. Given that the reports from this year’s attendees say that there were never more than a few hundred people in the Macy’s at any one time, I was wondering where they were getting their claim of 30,000 attendees in that article. What surprises me is this EXTREMELY VERY LOW rating from the Better Business Bureau has been like this for quite sometime for Louisiville Fandom Fest Convention….